Since we have a somewhat relaxed schedule the next three days, we slept in and left camp at 7am. Both of us are sleep deprived over the last week and we both didn’t sleep well last night with almost a full moon functioning like a light we couldn’t turn off. We were both groggy and a little slow getting out of camp. Good news was that it wasn’t hot out. Remarkably, as we head toward the Grand Canyon, there is a cold front coming in with wind gusts, a small chance for showers/thunderstorms, and temps in the 60s-70s. Just to give an idea of what we expected, we planned shorter days in anticipation of temps around 80F up here on the Kaibab Plateau and over 100F in the Grand Canyon in a few days. 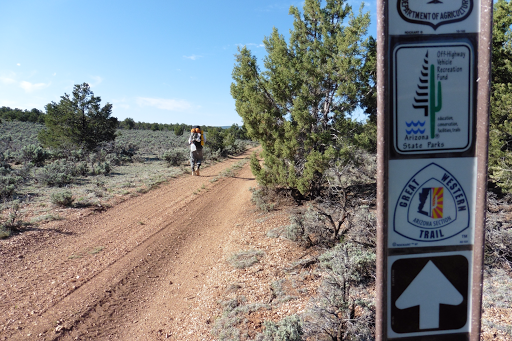 We will be extremely fortunate if we get a mild Grand Canyon…So, we had 9mi of dirt and gravel road walking to connect us back to the Hayduke this morning and it was pretty smooth sailing. 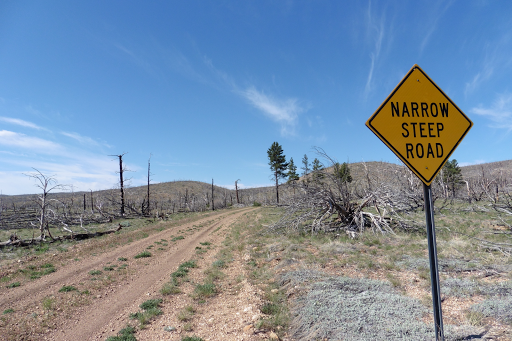 Our alternate route had us walking along the Great Western Trail, which is over 3,000mi long through Utah and Arizona I believe. The stretch we did was STEEP for a few miles early today and really took it out of us. We even stopped for a short break halfway up the climb just to rest. Nothing really eventful in scenery today. 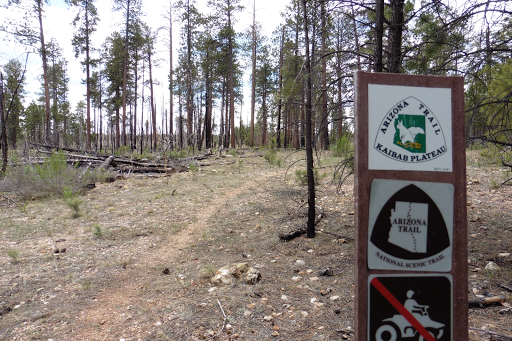 When we got back on the Hayduke, it had already been overlapping with the Arizona Trail for 30mi (near where our bonus alternate forked off) and we will be on the AZT for another 30 or so. 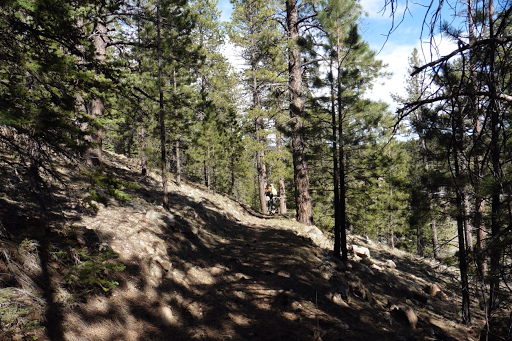 We saw three AZT hikers(Hank, Bird Food, and ?) and that was really fun. 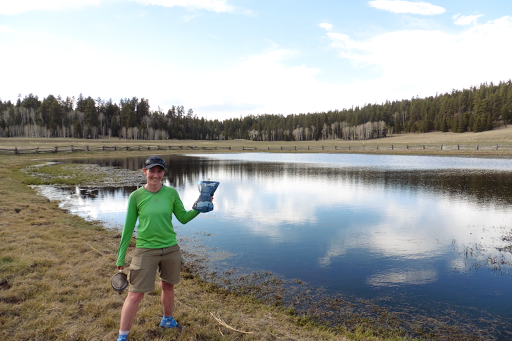 They are in their last leg and it was nice to also get water beta about many of the unreliable sources ahead. They also saw Katherine a half day ahead of us and two guys(we weren’t aware of) we have yet to meet and probably won’t catch up to with the way the Grand Canyon camping goes. We were in Arizona some last leg, and I failed to mention it. It’s weird cause AZ time is one hour earlier, but we aren’t changing…so my phone reads one hour early and I have to keep reminding myself that. 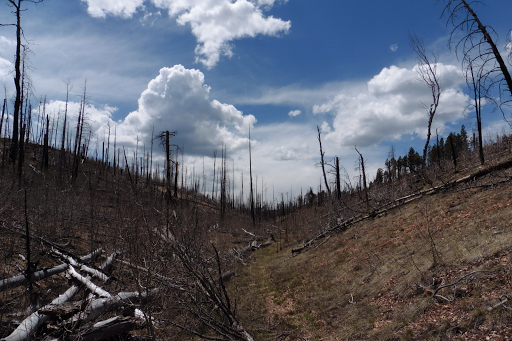 The AZT section was mostly burn area from the Warm Fire many years ago. Not people’s favorite thing, but I’ve always appreciated burn areas in a way. Seeing such destruction and scarring along with new growth and the few that survived, still standing and fighting to survive now fully exposed and alone. 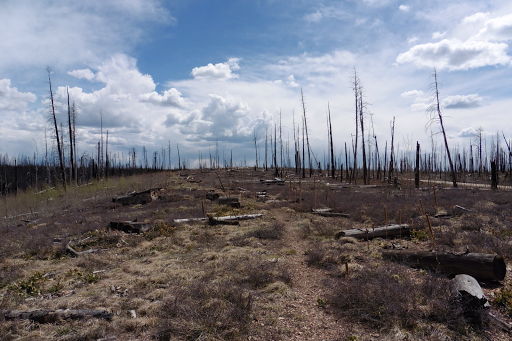 After the burn, it transitioned rolling woods, which I miss dearly out here and we really enjoyed today. The two of us were a mess today. Myself more than Gavin. Other than when I was throwing up at the beginning of the trail, this was the toughest day for me physically so far. 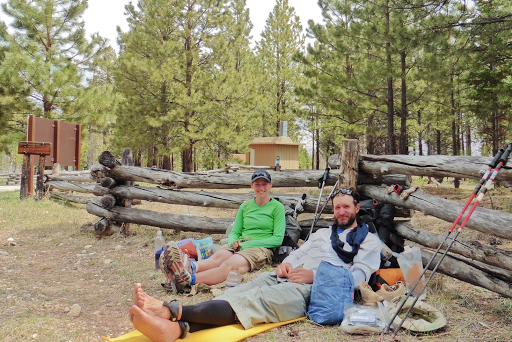 Gavin felt the same way and we think it’s the combo of our heavy packs (40-50lbs), being at high elevation on the Kaibab Plateau(8,600ft), gusty cool dry air, the big days we had last leg, and little sleep the last three nights. Here we are at lunch at a trailhead already tired. I had a slight sore throat last night and thought nothing of it just thinking I needed more sleep. Then, after lunch today, it got very painful as I hiked and I could barely talk without it closing up like I needed water, but water didn’t help. It would improve when we took breaks, so it must be the thin dry air with the high elevation. In conjunction with that, I got more worn out as the day continued. I’m the last three miles, both of us were ready to just stop for the day and LAY DOWN! It was perplexing for both of us, but kinda made sense with all the factors. 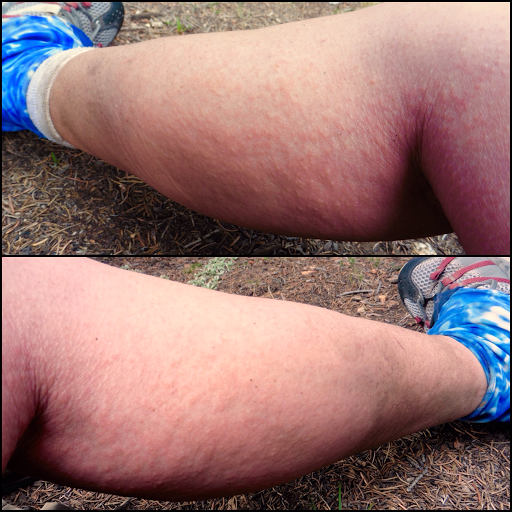 Oh, and let’s add to all this that it isn’t that hot or sunny and last night after 1hr of hiking, my legs broke out in a heat rash. Not enjoyable and I had hoped the heat rashes were done. It got worse today and here is the best shots I could get showing it more clearly. Not fun, but it should hopefully run its course by the end of the leg. It seriously looked like this one hour into hiking last night out of nowhere. We only needed to do 15mi and purposely planned for lower mileage days since we heard (and it was even confirmed by AZTers) that Hayduke mileages are listed lower than AZT miles. There was a stretch we did today that was noted as 8mi and the AZTers had it at almost 10mi. Hard to know what’s true, but it’s nice to have a buffer. We hiked 19mi total to land near a water source tonight. We are camped just after Crane Lake, a little cow infested, but good enough for the evening. We were at camp by 6pm and done with chores and laying down by 8pm. I’m excited I’ll be done blogging by 9:15pm and will probably crash hard. All my muscles and joints ache. 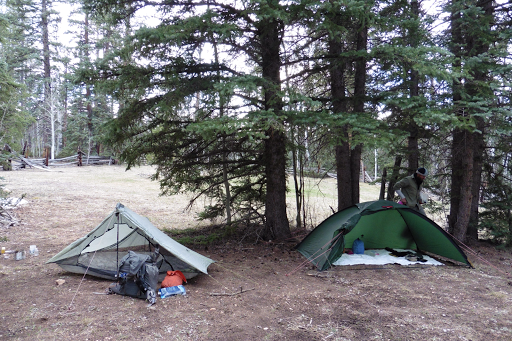 Gavin rarely sets up his tent, which is really just the outer shell part of a Hilleberg tent, so it looks huge. There is a chance of rain tonight, so he pitched his tent. We are at a site that seems to get a lot of use and hesitated worried about mice and deer, but were too tired to go somewhere else. We are already hearing some large animal that came trotting loudly and then stopped too far to see it, but made sounds like a horse breathing out hard…maybe elk…I did see some deer earlier today….at least it’s wooded and cloudy enough to block out much of the bright moon.